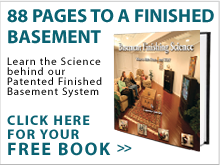 Total Basement Finishing is your local, certified Total Basement Finishing (TBF) contractor. As the local TBF dealer in your area, we have exclusive access to all the membership benefits of the network, including training, literature, and the TBF Basement Finishing System- your waterproof solution to quality basement finishing at an affordable price. 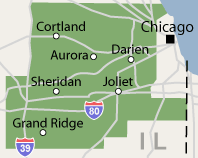 Total Basement Finishing proudly serves by licensed, trained professionals the Illinois area, including Berwyn, Wheaton, Skokie, Orland Park, Tinley Park, Boilingbrook, Oak Lawn, Oak Park, Lombard, Glenview, Saint Charles, Lockport, Elmhurst, Melrose Park, Plainfield, Carl Stream, Elmwood Park, Dekalb, Evanston, Northbrook, Mount Prospect, Downers Grove and many areas nearby. Call or e-mail us today for a free basement finishing quote! Total Basement Finishing is an international network of independently owned and operated contractors, working from coast to coast in the United States and Canada. Headquartered in Seymour, Connecticut in a 92,000 square foot facility, it's the fastest-growing basement finishing contractor company in the world. Members of the TBF network have access to continuing free training sessions, where employees from all over the world can meet with our owner and trainers to hone their skills, learn about new products, and benefit from one another's experiences. Additional literature, video media, and other training materials are made available to each of our dealers on a continuing basis. And, of course, our staff is always available to dealers in the event they have any products or system design questions. Each year, TBF dealers gather at the headquarters for our Annual Convention. Employees and owners engage in a week-long marathon of employee training, product demonstrations, and networking. Each convention ends with a fantastic keynote speaker, with previous speakers including well-known leaders such as Brian Tracy, Les Brown, Nick Vujicic, Walter Bond, and Joy Baldridge. The Founder of Basement Systems® Inc.
Larry Janesky, president of the Total Basement Finishing Network, has been in the basement business since 1987. He is the author of five books, an acclaimed public speaker, an inventor with more than 30 patents and business leader with 27 years of real world accountability and success. He was elected as the Greater New Haven Businessperson of the Year in 2009, and the Hartford Business Journal cited his company as one of the Ten Best Places to Work in Connecticut in 2006. He has been awarded the BBB's Business Integrity Award an unprecedented three times and continues to maintain an A+ rating in the Connecticut branch. Larry has been in basements all over, and he has seen the best and worst that basements have to offer. For more than two decades, he has been developing products that are just what a basement needs to be transformed from a damp, musty place into a warm, comfortable, and naturally private living space. As the leader of TBF, Larry Janesky has been the driving force of the network's culture of quality, professionalism, timely installation, and most of all -- innovation. We never stop looking for new ways to improve on what's already out there -- and we're leading the industry in new and better ways to finish basements! To ensure the highest quality in our products and installations, the TBF Headquarters maintains a full-time Research and Development Team. Their team is working each day to test and research new products on the market to keep our contractors on the cutting edge of the industry. We're constantly in the process of improving what we offer as the industry advances and improves, and we bring the benefits of that research directly to you. Both our ThermalDry® Basement Flooring and our TBF EverLast™ Wall Panel System are Gold Winners of the CQIA Quality Improvement Award, and our basement finishing system has been featured on several television shows, including Ron Hazelton's HouseCalls. Total Basement Finishing's basement dehumidifier has won a Silver CQIA award and has been ENERGY STAR® certified for energy efficiency. Our basement windows feature a vinyl frame and double-thermopaned Low E glass for the best in energy efficiency. Each product in our basement finishing system comes with a written warranty- including the 50-year written warranty for water and mold resistance for our basement walls, and our 30-year no-sag, mold-resistant warranty included with our ceiling tiles. BBB Reputation - Each dealer is in good standing with the Better Business Bureau. Well-Established Businesses - TBF Dealers are selected from contractors who have stable, well-established businesses. You can count on us to be in business in the future, should you ever need alterations, additional work, or warranty work on your finishing system. Excellent Customer Service - TBF appreciates the fact that you don't want run-around, and you don't want to talk to an answering service. We care about customer service: you can count on us to be there -- in person -- when you need to talk to someone. Quality Installations - We are dedicated to quality installations and responsible workmanship. You can count on us to finish your basement in the time we say we will-- and do it right! Free, On-Site Consultations - TBF dealers have all agreed to provide customers with free, no-obligation basement finishing quotes for homeowners within their local service area. People are talking all over about the great service Total Basement Finishing specialists provide! Check out our worldwide customer testimonials! Or, for more information, call or e-mail us today for a no cost or obligation free basement finishing quote by one on our experienced professionals!